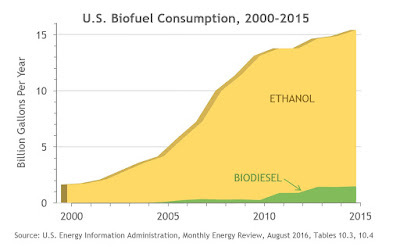 Just to provide an updated picture of the rise in U.S. biofuel consumption, here's a chart based on the latest annual data from EIA's Monthly Energy Review (MER). 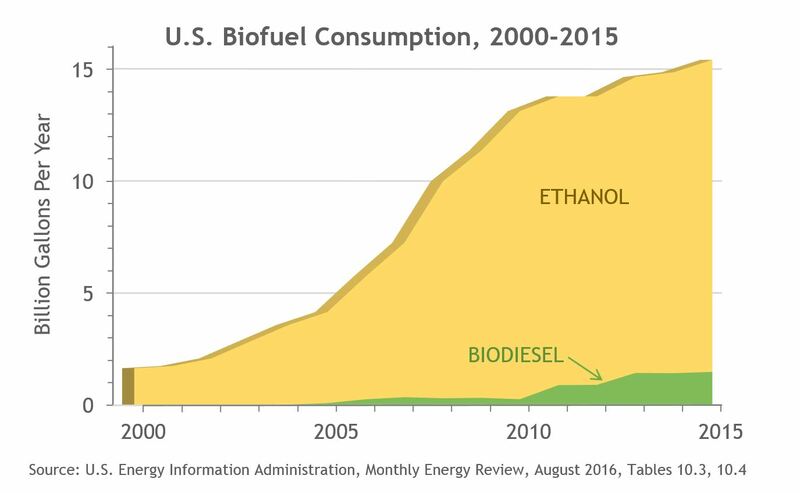 As of calendar year 2015, U.S. ethanol consumption was 13.9 billion gallons per year, up from 1.7 billion gallons in 2000. In 2000, biodiesel consumption was below the level of significance for EIA reporting (i.e., statistically zero relative to overall U.S. motor fuel use). Biodiesel consumption reached 1.5 billion gallons in 2015, and so total biofuel consumption amounted to 15.4 billion gallons that year. For context, U.S. motor gasoline consumption was 140 billion gallons and distillate fuel oil (which is mostly but not all highway diesel) was 61 billion gallons last year. In terms of carbon, biofuels accounted for 4.7% of total direct CO2 emissions from the U.S. transportation sector in 2015. A short URL for embedding this chart is: https://goo.gl/rM5EpM. If you use it, please credit this blog. The source data can be downloaded as Tables 10.3 (for ethanol) and 10.4 (for biodiesel) from the Renewable Energy section of EIA's MER webpage. 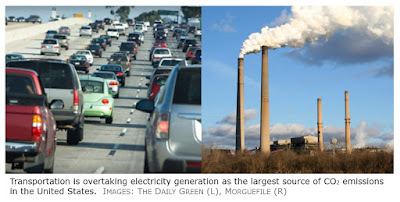 Transportation, which runs almost entirely on petroleum fuels, and electricity generation, which had used mainly coal, have long been the largest sources of CO2 emissions in the United States. Although power plant smokestacks exceeded motor vehicle tailpipes and other mobile sources such as aircraft in terms of CO2 emissions for nearly forty years, this year brings a crossover of these two emission trends. 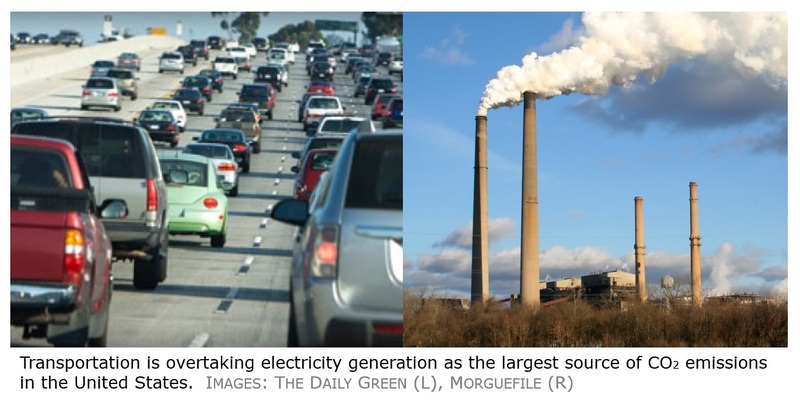 The CO2 emitted by the transportation sector has been greater than that from the power sector for seven of the past eight months, and so 2016 is on track to see mobility overtake electricity as the country's biggest contribution to global warming.